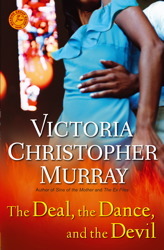 THE DEAL, THE DANCE, & THE DEVIL by Victoria Christopher Murray asks: What would you do for five million dollars? Would you, say, sell your marriage to the devil? THE DEAL, THE DANCE, AND THE DEVIL is such a vibrant, entertaining novel. The voice of the protagonist, Evia, jumps off the page that it feels like she's a friend you've known for years. I honestly just can't get over how electric her voice is! This is the kind of book you read from cover to cover in one sitting, super fast and super fun with a great twist at the end. I can't believe this is the first book that I've read by Victoria Christopher Murray. She has at least ten other novels out, so I will definitely check out her most recent book, SINNERS AND SAINTS, which came out earlier this year. All I can say is I'm very, very impressed.